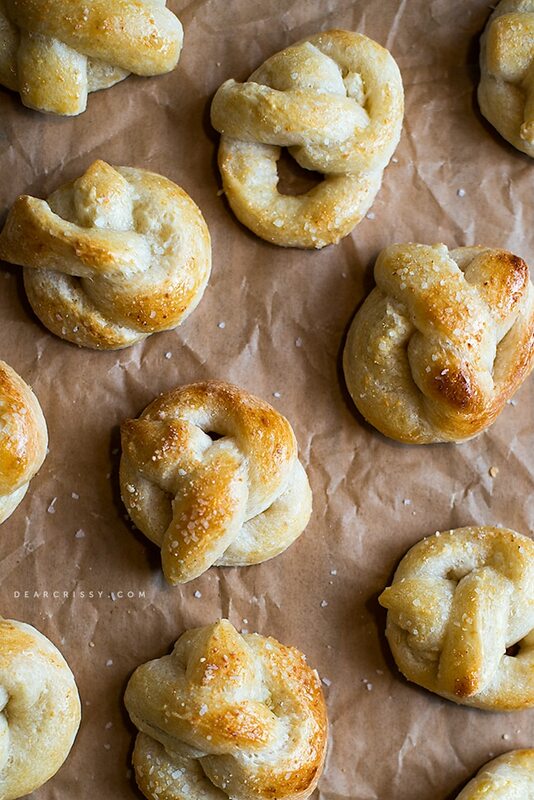 Soft, chewy pretzels are one of my favorite snacks. In fact, I’ve been craving a big, soft, chewy pretzel and decided to use that inspiration to make some fun mini soft pretzels for the kids. The best part? They are super simple to make! While I love the idea of making soft pretzels from scratch, when it comes to snacks for the kids, quick and easy are king. 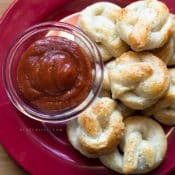 These mini circus-inspired pretzels really couldn’t be any easier to make because they feature Pillsbury breadsticks that you can pick up in the refrigerated aisle at the grocery store. You just cut them lengthwise, form a rope, twist them into shape, brush with egg then sprinkle with some seasonings and bake. Check out the video below to see how it’s done. These soft mini pretzels make such a great fast-snack for your kids, and they’ll love how small and cute they are. Perfect for little fingers! You could stick with a little kosher salt to top your mini pretzels, but I also sprinkled ours with a little garlic powder and grated parmesan cheese. 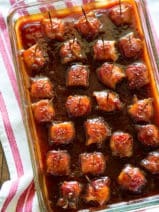 This gave them a nice flavor, and goes well with pizza dipping sauce. 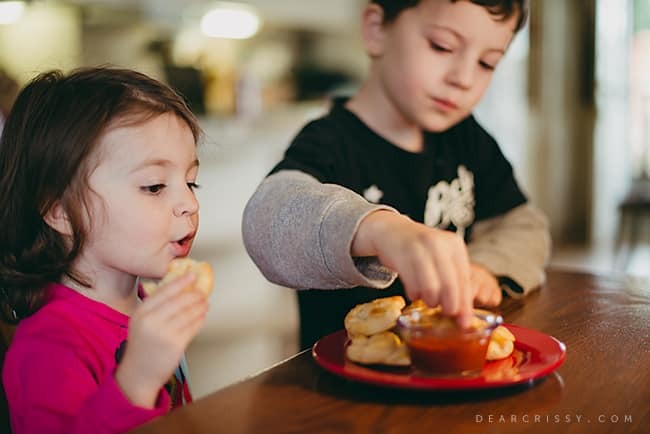 As you can see, Evan and Kara love this mini soft pretzels recipe! 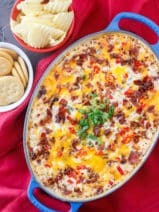 I hope you enjoy this fun recipe! These soft, chewy pretzel bites are perfect for dipping in your favorite sauce and enjoying anytime. Heat oven to 375°. Unroll dough; separate into 12 breadsticks. Cut each in half lengthwise. Roll each breadstick lightly to form 10-inch-long rope. Remove pretzels from cookie sheet. 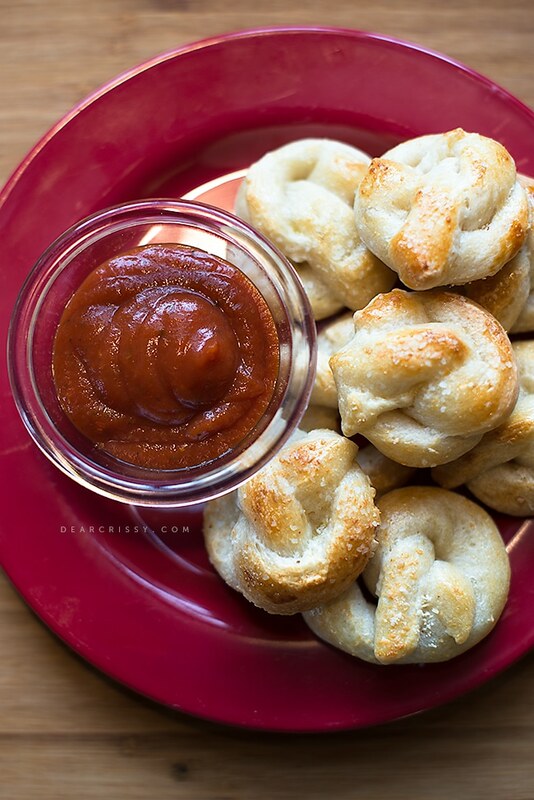 Serve warm pretzels with pizza sauce. These look amazing! Definitely pinning!! Thanks for sharing! Where can I buy the breadsticks? I looked at fry’s (kroger) and they do not carry them, these look fabulours….do they taste like pretzels? 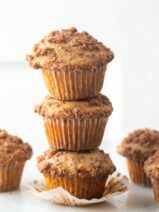 I bet these would be good with Sugar and cinnamon too and a dessert pretzel! My mouth is literally watering right now. Those pretzels looks delicious.